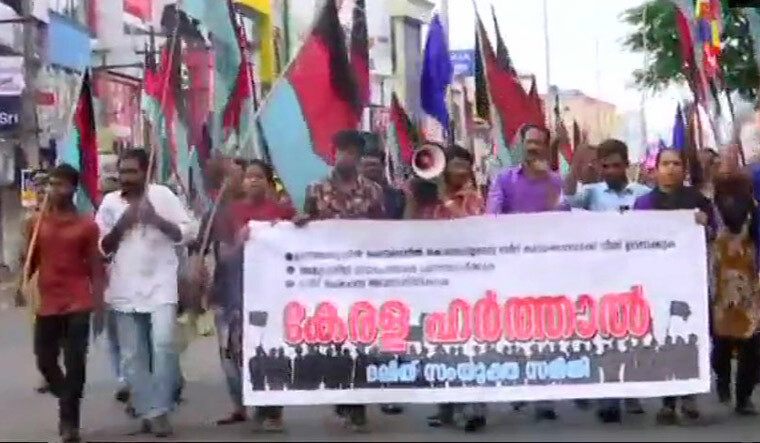 Exactly a week after Bharat Bandh, various dalit outfits had called for a dawn-to-dusk hartal in Kerala on Monday to condemn the police atrocities unleashed on the protests held across north India by the community members on April 2 protesting the 'dilution' of the Scheduled Caste and Scheduled Tribe (Prevention of Atrocities) Act (SC/ST Act). The hartal has evoked a mixed response in the state. M. Geethanandan, leader of Adivasi Gothrasabha, was taken into custody by the police in Kochi for allegedly trying to stop vehicles. Nearly seventy people have been detained by the police at several places for trying to disrupt traffic in Kerala dalit protest. Kerala is witnessing its second state-wide shutdown within one week. On April 2, various trade unions in the state had called for a 24-hour shutdown to protest against the Centre's decision to extend fixed-term employment to all sectors. Meanwhile, a few exams have been rescheduled due to the dalit protests in Kerala. The Mahatma Gandhi University has decided to postpone all the exams, except 2nd year B.Pharm, to April 23. The B.Pharm examination will be held on April 16. The Calicut University has postponed the practical examination of sixth semester BSc Botany in Thrissur district to April 16. Kerala, Calicut and Kannur varsities have also postponed all exams scheduled for Monday. On Monday, Kerala dalit protesters took to the streets and tried to stall traffic in Kochi, Kozhikode, Palakkad, Kollam and Thiruvananthapuram. Kerala State Road Transport Corporation (KSRTC) buses started services to Coimbatore with police protection in view of the Kerala dalit protest. The state transporter has so far pulled off 20 services from Palakkad with police protection. In the northern Kerala district of Kasargod, cars and public transport, including Kerala and Karnataka RTC buses and autorickshaws, remained unaffected. Isolated incidents of protesters stalling cars was reported from Periya, Bheemanady and Manjeeswaram. In Palakkad, dalit protesters attacked an autorickshaw. Private buses stayed off the road at Palakkad and Wayanad. Thrissur was the least affected by the Kerala dalit protest. Private buses and state transport bus services remained normal. KSRTC is also running special services to the Medical College Hospital. Protesters pelted stones at an RTC bus in Thrissur injuring the bus driver during the Kerala dalit protest. Stone pelting on buses was reported from Muriyad in Thrissur and Kollam as well. The hartal has been jointly announced by around 30 organisations, including Cherama Sambava Development Society (CSDS), Akhila Kerala Cheramar Hindu Mahasabha, National Dalit Liberation Front, Dalit Human Rights Movement, Kerala Cheramar Sangham, Social Liberation Front, Bahujan Samaj Party and Dravida Varga Aikya Munnani. Dalit organisations demand that the killing of Dalits in Madhya Pradesh, UP and Rajasthan in the clashes be inquired by a judicial committee. The other demands are that murder cases be registered, compensation be given to the families of the deceased, and that the SC/ST Act should not be diluted. Essential services, including milk, newspaper, hospital and marriage functions, have been exempted from the hartal.